A mathematician may say anything he pleases, but a physicist must be at least partially sane. Attributed. 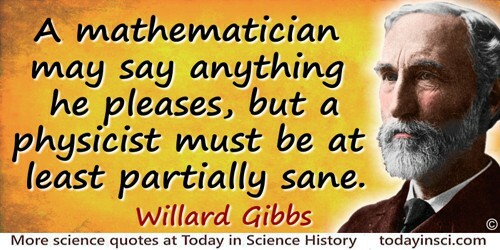 Cited in R. B. Lindsay, 'On the Relation of Mathematics and Physics', The Scientific Monthly, Dec 1944, 59, 456. Finally in a large population, divided and subdivided into partially isolated local races of small size, there is a continually shifting differentiation among the latter (intensified by local differences in selection but occurring under uniform and static conditions) which inevitably brings about an indefinitely continuing, irreversible, adaptive, and much more rapid evolution of the species. Complete isolation in this case, and more slowly in the preceding, originates new species differing for the most part in nonadaptive parallel orthogenetic lines, in accordance with the conditions. It is suggested, in conclusion, that the differing statistical situations to be expected among natural species are adequate to account for the different sorts of evolutionary processes which have been described, and that, in particular, conditions in nature are often such as to bring about the state of poise among opposing tendencies on which an indefinitely continuing evolutionary process depends. In 'Evolution In Mendelian Populations', Genetics, (1931), 16, 158. I always feel as if my books came half out of Lyell's brain... & therefore that when seeing a thing never seen by Lyell, one yet saw it partially through his eyes. Letter to Leonard Horner, 29 August 1844. In F. Burkhardt and S. Smith (eds. ), The Correspondence of Charles Darwin 1844-1846 (1987), Vol. 3, 55. In the case of elements, as in that of individuals, the determination of character is often attended with very great difficulty, a true estimate being only slowly arrived at, and when at last such an estimate is found, it can only be very partially expressed in words. Many will, no doubt, prefer to retain old unsystematic names as far as possible, but it is easy to see that the desire to avoid change may carry us too far in this direction; it will undoubtedly be very inconvenient to the present generation of chemists to abandon familiar and cherished names, but nevertheless it may be a wise course to boldly face the difficulty, rather than inflict on coming generations a partially illogical and unsystematic nomenclature. 'International Conference on Chemical Nomenclature', Nature (19 May 1892), 46, 57.